I must be feeling bold because I'm about to disagree with James Beard. I just read Beard on Bread and was a bit dismayed with what he had to say about sourdough bread. He wrote: "Despite my own feeling that sourdough bread is much overrated and is difficult to perfect at home I am including one recipe in this collection because interest in the subject is so tremendous... I'm not sure it is worth the trouble." Difficult? Not worth the trouble? I wish I could have had the opportunity to convince him otherwise. Yes, making bread from a sourdough starter requires time and patience, and yes, the results vary depending on the strength of the starter, the weather, and the flour used, but it also seems a little like magic to make bread with such simple ingredients and a home-grown, living, wild yeast starter. With bread-baking, time means flavor, and nothing compares to the taste of slowly fermented and proofed sourdough. I could go on all day about my love of sourdough bread baking, and it's interesting to note that the one sourdough recipe Beard included in this book was made with a starter created from commercial yeast rather than being grown from wild yeast. But, the book is full of several interesting breads of other types. The pizza caccia nanza with pieces of sliced garlic and rosemary inserted in the dough before baking sounds delicious. Jane Grigson's walnut bread from southern Burgundy with onions, walnuts, and walnut oil is one I plan to try too. There are also quick breads, rolls, pita, doughnuts, biscuits, and monkey bread to name a few. So, there are many great things about this book even if Beard was completely wrong about sourdough. One of those great things was the recipe for a rich cornbread. This was one of Beard's oldest bread recipes and one of his favorites. 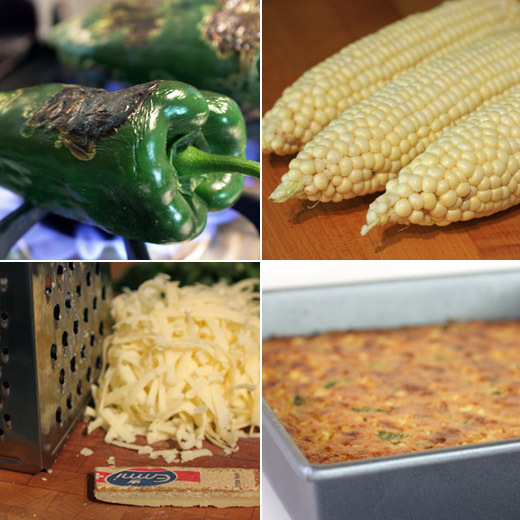 Not only is this cornbread filled with fresh corn kernels and chopped green chiles, there's grated cheese and a full cup of sour cream. Canned, chopped green chiles are suggested, but since I like to roast chiles, I made my own. I roasted two poblanos on top of the stove and then peeled, seeded, and chopped them. Then, kernels were cut from three ears of fresh corn, and a quarter pound of gruyere was grated. Making the bread couldn't be simpler since you just stir together yellow cornmeal, salt, baking powder, that full cup of sour cream, three quarters of a cup of melted butter, two eggs, the grated cheese, and chopped chiles. The mixture was baked in a nine inch square pan, and it browned nicely on top. 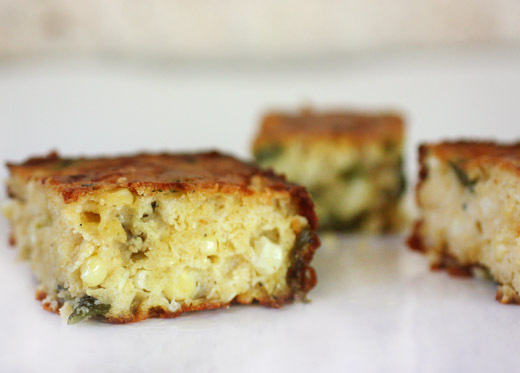 This is no typical, dry, crumbly cornbread. It was more of a meal in the form of cornbread with a tender crumb and lots of flavor and texture, but it was decadently delicious. I had lots of local, summer vegetables on hand like okra, tomatoes, black-eyed peas, and more corn, so I made a fresh, simple vegetable stew to accompany it. Beard might have been wrong to dismiss homemade sourdough, but clearly, he knew of some pretty good other breads. There were two tomato tarts vying for my attention. One of them was small and round and beautiful with various colors of cherry tomatoes on top. It was made with homemade pastry. 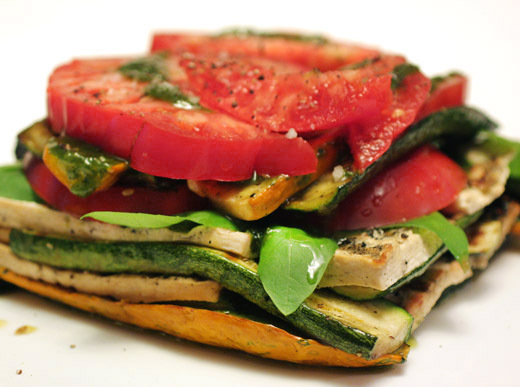 The other was a delectable, large rectangle covered with red cherry tomatoes and herbs. That one was built on a base of store-bought puff pastry. In the end, my laziness won out, and using puff pastry from the store was the deciding factor. I did find a pretty mix of colorful, local, cherry tomatoes, so I achieved the look of the other tart somewhat. 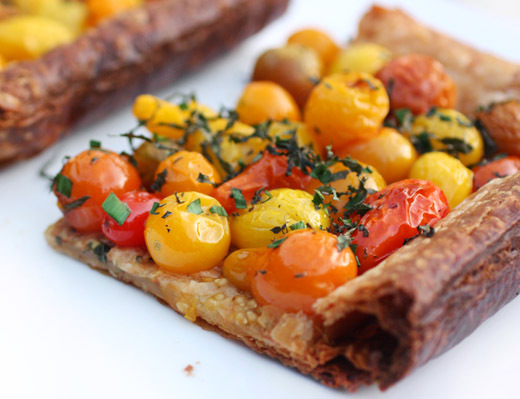 This herbed tomato tart is from The New Comfort Food . 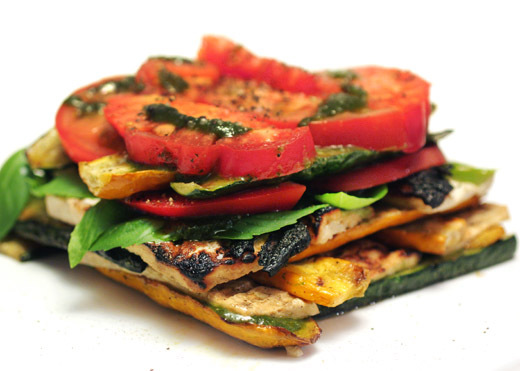 The simple look of the tomato topping belies the hidden combination of flavors. 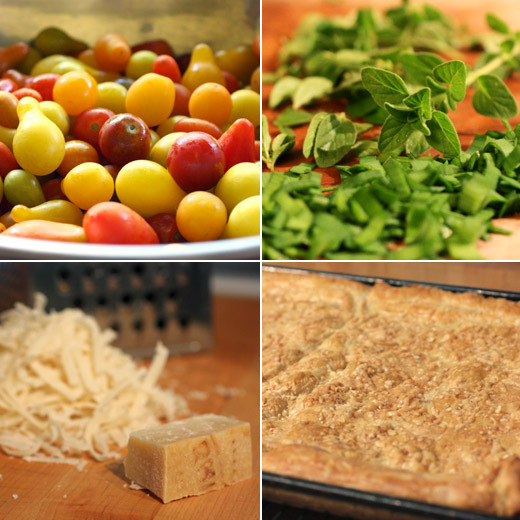 Before the tomatoes were placed on the tart, shredded parmigiano cheese was added and baked onto the pastry layer. Also, you'd never pick out the singular taste of anchovies here since they were finely chopped and tossed with the tomatoes before roasting, but they add an addictive, savory note. With rich, buttery pastry, sweet, roasted tomatoes, and the hidden umami of the cheese and anchovies, this tart tasted even better than expected. Since I chose to make this out of laziness, it's obviously not difficult to prepare, but there are three steps to the process. First, two sheets of puff pastry were fitted into a sheet pan, docked and weighted to prevent puffing, and baked for 25 minutes. The pie weights were removed, and shredded parmigiano was spread over the tart shell. It baked for an additional 15 minutes. Then, the cherry tomatoes were tossed with olive oil, finely chopped anchovies, and I added a little minced garlic. The mixture was roasted under the broiler for about 12 minutes, and the pan was shaken a few times while roasting to turn the tomatoes. Last, the tart shell was filled with the tomato mixture, chopped basil, chives, and oregano were sprinkled on top, and it was baked for a last and final 15 minutes. 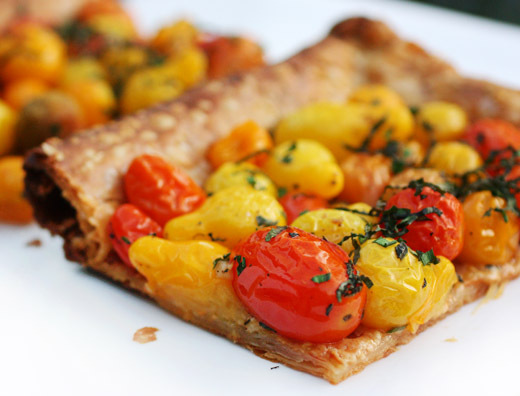 Even though the base of the pastry bakes up thin, and the toppings are mostly just fresh tomatoes and herbs, this is a rich and filling tart. The decadent, buttery, sweet, and savory flavors are perfect with a crisp, light salad, and a glass of wine. I'm glad my laziness got the better of me since I ended up learning the secrets of the hidden, big flavor in this simple tart. Learning about a place through the food makes the learning process enjoyable. In Claudia Roden's newest book, The Food of Spain of which I received a review copy, you'll learn the history of all of Spain's regions and how the different people who settled in each area and later moved about the country shaped what has become Spanish cuisine. Because of this background information, you'll know that meat cooked with fruits came from an Arab influence, eggplant fritters and adafina, a slow-cooked stew, came from Jews, bechamel and the use of cream and butter was from the French, and the chiles which became the ubiquitous pimenton arrived after explorations in the New World. All of these angles of influence along with descriptions of the different types of geography from one region to the next explain the evolution of Spanish food over time. Through the recipes, you'll see how food traditions live on in typical home-cooked dishes, and all of the recipes in the book are written for contemporary cooking styles with ingredients that are easy to find. 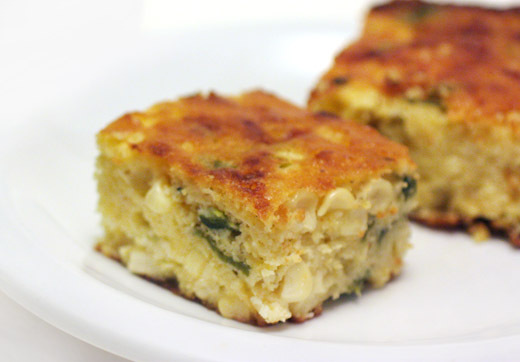 There are classic dishes like tortilla espanola with potatoes along with variations like the vegetable tortilla with peppers, eggplant, and tomato. There are fish dishes like salmon with peas and fish stew with peppers and tomatoes. From the poultry chapter, there's chicken and shrimp with almond and chocolate sauce and quail with grapes. There are meat dishes, rice and pasta and paella of course, and bean and chickpea stews. The dessert chapter offers everything from fruit in wine to ice creams, cakes, pastries, and flans. To begin cooking from this book, I chose the coca which is like pizza. Ordinarily, the toppings for coca are made up of whatever is available or leftover from previous meals. Some canned anchovies or tuna or maybe sliced sausages could be added, but I prepared the version shown in the book with just roasted bell peppers and eggplants. The dough for the coca is almost exactly the same as the dough I use for pizza. Bread flour, salt, olive oil, yeast, and water were combined, kneaded, and left to rise for an hour or two. Meanwhile, eggplants were pricked with a knife and placed on a baking sheet with whole bell peppers. I found some pretty local, sweet peppers in red and yellow. The vegetables were roasted in a 350 degree F oven for about 45 minutes or until the skins were blistered. After the peppers had cooled, the skins and seeds were removed, and they were sliced. The skins of the eggplants were removed, and the flesh was placed in a colander to drain and then chopped into big chunks. 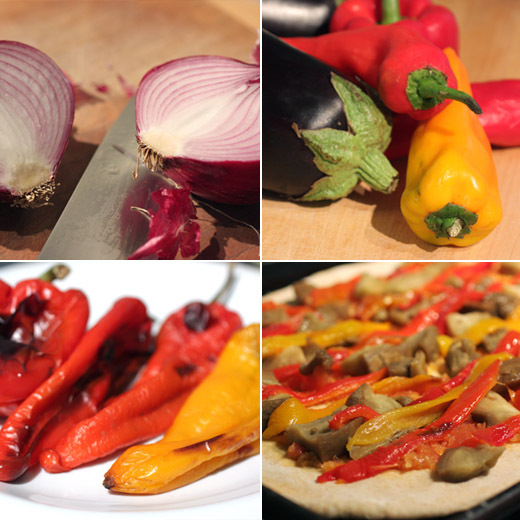 The eggplant and peppers were seasoned and tossed with oil and set aside. 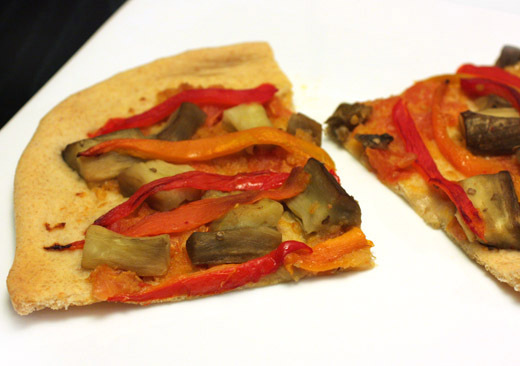 Rather than spreading a thick sauce on the dough, a mixture of sauteed, chopped onion and tomato was used. Onion was sauteed in olive oil until soft, and fresh, peeled and chopped tomatoes were added and left to cook until the liquid evaporated. The dough was cut in half and each half was rolled into a big oval. 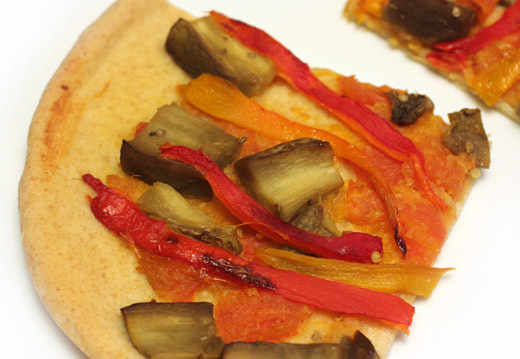 Each oval of dough was placed on an oiled baking sheet, topped with some of the onion and tomato mixture, and the bell peppers and eggplant were placed on top. The cocas baked for about 30 minutes until browned and crisp. Reading the book was like a whirlwind, guided tour of Spain, and cooking from it is like stopping in at private homes along the way. Next, I'd like to try the fideos with seafood or maybe the chestnut and chocolate flan. It'll continue to be a delicious learning experience. See my review of The Food of Spain and get this coca recipe at Project Foodie. In late May and throughout June, I keep an eye out for organic, fresh cherries. 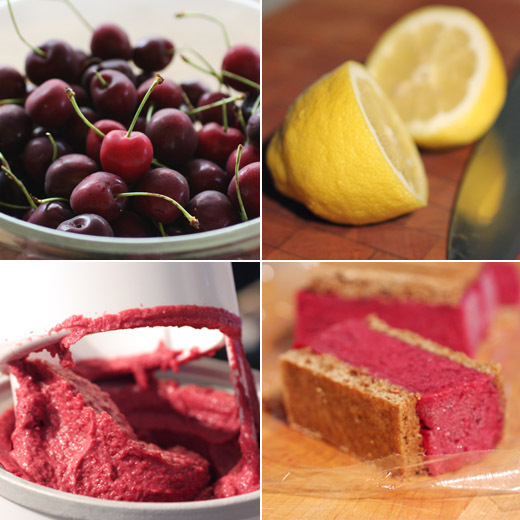 Conventionally-grown cherries will make appearances around town, but organic ones seem to be harder to find. I started asking around about them since I was sure I must have darted right by them without noticing at some point. Then, as if they knew I was starting to panic, a few days later, Whole Foods announced a one-day, organic cherry sale. I got to the store as early in the day as I could and loaded several pounds of cherries into my shopping cart. 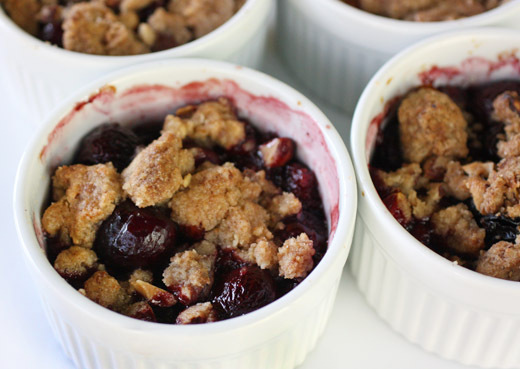 I tell you all of this to explain the many, cherry-filled dishes that will be showing up around here starting with this one. 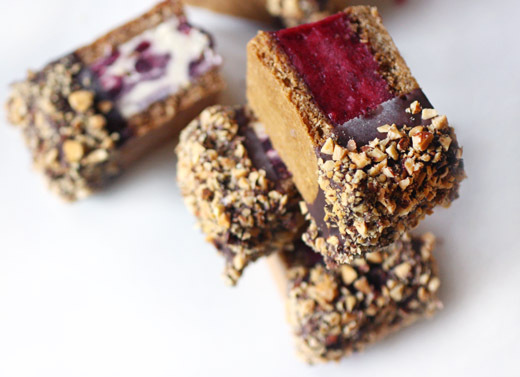 These individual cherry lambic crisps were shown in the June issue of Food and Wine, and that issue was full of recipes made with beer. 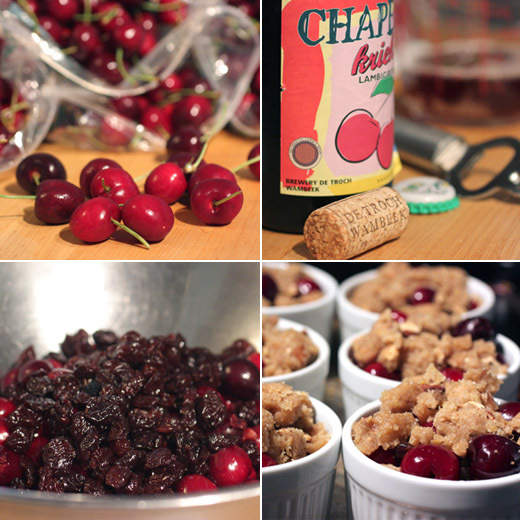 In this case, a cherry lambic was mixed with the fruit for the base of the crisp, and dried sour cherries were added to the fresh, sweet, dark cherries. I was intrigued. So, a combination of cherry beer, fresh and dried cherries, honey, and seeds from a vanilla bean was mixed and left to sit for 30 minutes. The dried sour cherries plumped, and juices from the fresh cherries mixed with the honey and beer. 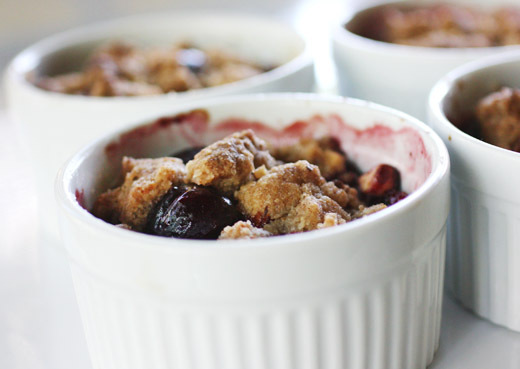 The fruit mixture was divided between six ramekins. The crisp topping was fairly standard with sugar, flour, chopped almonds, brown sugar, cinnamon, nutmeg, and cardamom. Orange zest was to have been added, but I used lemon zest instead. Melted butter was stirred into that mixture, and it was pressed by hand to form clumps as it was added to the top of each ramekin with fruit. The crisps baked for about 30 minutes to a bubbly and golden state. The crisps tasted like cherries rather than beer, but then, the taste of cherry lambic itself is more of cherries than of beer. The chewy, dried sour cherries added a nice contrast to the sweet, fresh ones, and the topping's buttery crunch was made even better by the addition of chopped almonds and spices. 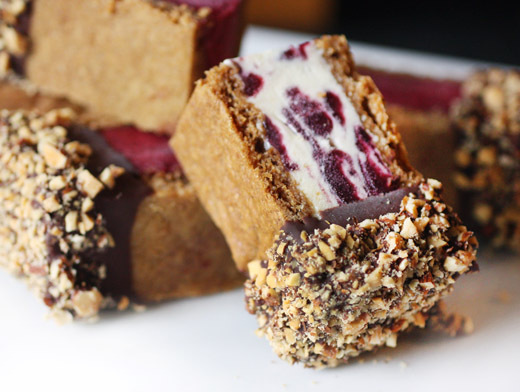 I would definitely make this again with the exact same ingredients, but I think a version with wine-soaked fruit might be interesting too. It happened again. I was watching an episode of Barefoot Contessa, oddly enough it was one I hadn’t seen before, and as usual, right away, I was compelled to make the thing that she had just made. She was preparing lunch for a friend. 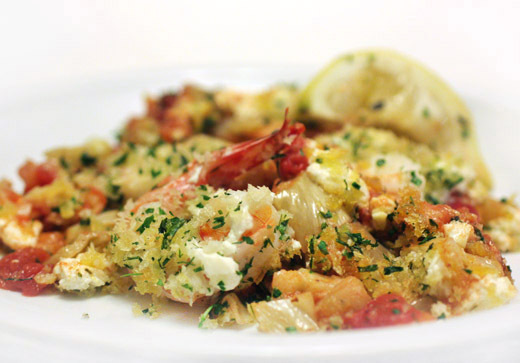 There was sauteed fennel and a splash of white wine and a little Pernod, diced tomatoes, shrimp, feta, and breadcrumbs. Things were sauteed on top of the stove for a few minutes, and then the dish went in the oven for just enough time for the shrimp to cook through and the breadcrumbs to brown. She brought it to the table in the pan straight from the oven. It was easy and fun. I had to do this. The recipe is on the Food Network site, and it’s also in her book Barefoot Contessa How Easy is That? In that same episode, she and her friend also made an incredible-looking salted caramel ice cream for dessert. I’m not sure why, but that recipe is nowhere to be found on the web site or in her book, or I would have made that too. [Update: Thanks to a commenter, the recipe was found. It's on the Barefoot Contessa site. Wish I would have thought to look there!] But, back to the shrimp. I made this for dinner the next night. The shrimp, fennel, and tomatoes were scooped onto plates and served with bread for dipping into the sauce exactly as Ina had served it. It was casual, great for summer, couldn't have been easier, and tasted like it should have involved much more effort than it actually did. 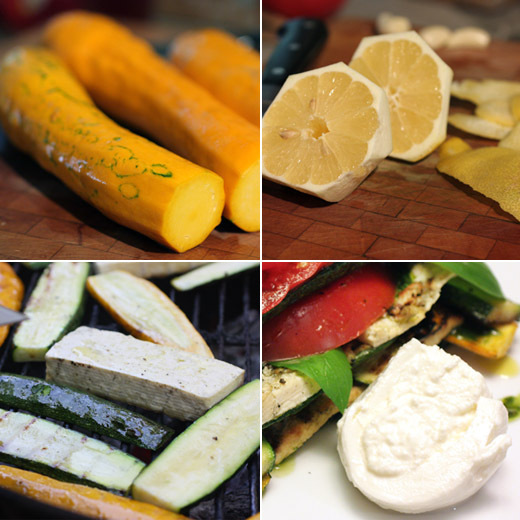 This goes quickly, so you'll want to have all the ingredients prepped and ready. First, diced fennel was sauteed in olive oil, and then minced garlic was added. White wine was used to deglaze the pan, and then canned, diced tomato, tomato paste, and some oregano were added followed by just a tablespoon of Pernod. It really does add nice, anise flavor with just that small amount. 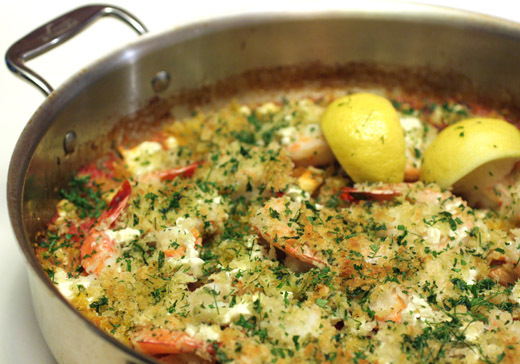 This mixture was left to simmer for about fifteen minutes before the shelled and deveined shrimp were set on top. Crumbled feta was strewn about the pan, and then a mix of breadcrumbs, parsley, and lemon zest was sprinkled on top. The saute pan went into a 400 degree F oven for fifteen minutes, and then it was served with lemon wedges and bread. I don't think I've ever made a Barefoot Contessa dish I didn't like. Sure, sometimes a disconcerting amount of butter is involved, but not in this case. 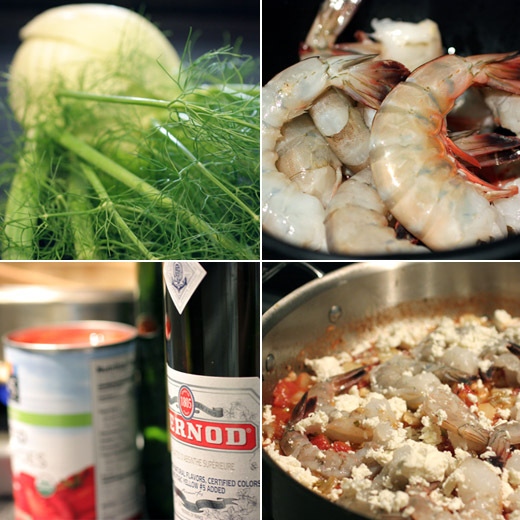 Here, the shrimp and fennel were fresh and light with just a little richness from the feta. With some toasted sourdough bread on the side, this meal was as easy, fun, and casual as it looked like it would be. I think I might have started a new thing for family birthdays. It's happened twice now, so it's at least on its way to becoming a thing. Since I bake a lot, and I really can't or shouldn't eat as much as I bake, I decided to send cookies to family members on their birthdays. I'm sure that now this is in writing, I'll not have time to send cookies for the next birthday. It might just be a when-I-have-time thing, and that way the cookies will always be a surprise, right? 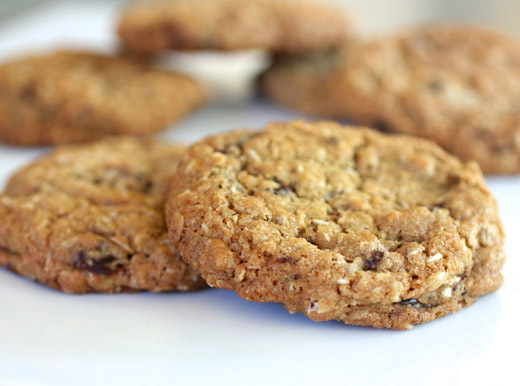 This cookie recipe is from The Greyston Bakery Cookbook , and coconut is added to the dough. I bought a bag of natural, unsweetened, shredded coconut and then worried that the cookies wouldn't be sweet enough since I didn't use the regular, sweetened stuff. I tasted the dough before I baked the cookies to see if I thought I should add more sugar, and it seemed good to me. Kurt was happy to taste test a cookie fresh out of the oven, and his reaction made me confident they were just fine. The cookies almost disappeared before I could box them up for shipping. There was nothing unusual about making the cookie dough here. You could use chocolate chips, but the recipe called for chunks, so I chopped a bar of bittersweet chocolate into bits. At two different cooking classes I attended, I learned the same lesson from both Nick Malgieri and Alice Medrich. 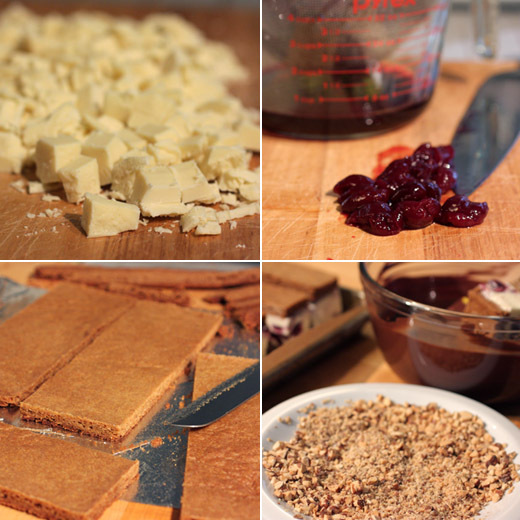 When you chop chocolate into chunks for cookies, you want to leave the chocolate dust behind. Nick Malgieri places the chopped chocolate in a sieve and shakes it to remove the pulverized stuff and keep the chunks. Alice Medrich used her hands to pull the chunks away from the dust on the cutting board. 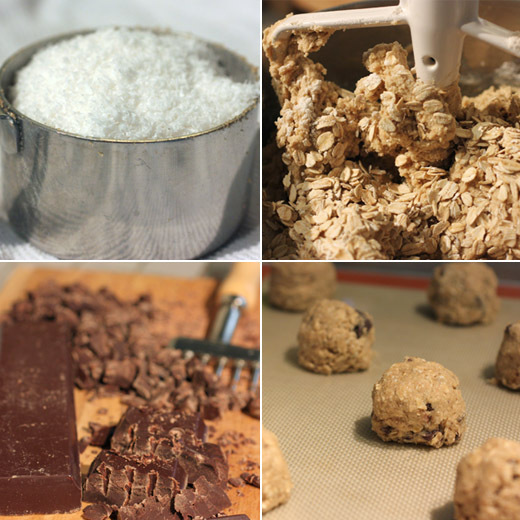 The fine, powdery chocolate muddies the look of the dough and using only the chunks results in a neater cookie. So, cream butter and brown sugar, add an egg and vanilla, sift flour, baking soda, and salt and add oatmeal then add that to butter mixture, then fold in shredded coconut and natural, unsweetened is fine and neat, dust-free, chocolate chunks. Drop into mounds on baking sheets and bake. 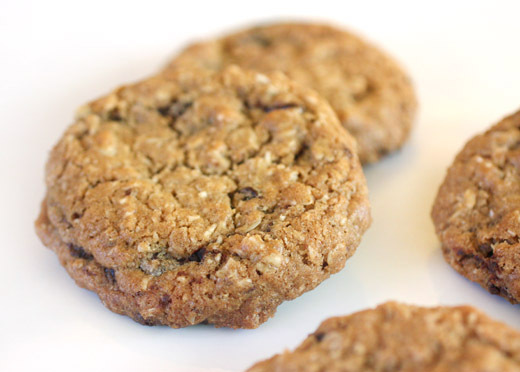 These were easy, straightforward cookies, but the addition of coconut to an oatmeal chocolate chunk cookie was new for me. It's an excellent addition, adding a little chewiness, and one I'll continue to include from now on. Actually, now that Kurt knows about this cookie flavor and will no doubt be requesting it frequently, I'll be baking a lot of these cookies. The other day, I mentioned the box of San Marzano tomatoes I brought home. Most of them ended up peeled, chopped, and bagged for the freezer. But, a few of them were set aside for oven roasting, and is there a sweeter, more lovely tomato flavor than what you get from slow roasting? Store-bought, sun-dried tomatoes are intensely tomato-flavored and that's perfectly nice too, but with oven roasting, you can stop the process at any point to retain a little moisture for a semi-dried effect. The result is a cross between the chewy, completely dried variety and juicy, fresh tomatoes. This dish is from Plenty which has become my go-to source for dishes with great flavor and no meat. In the book, Castelluccio lentils are suggested, and the new bulk section at our Whole Foods offers a plethora of dried bean varieties but no Castelluccios. Instead, I found black, beluga lentils which are a cute, little size and nice, dark color and worked just as well for this. 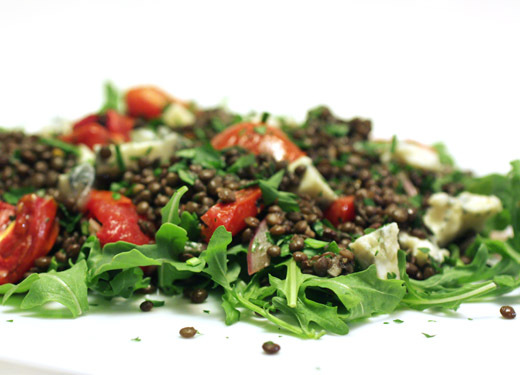 Another good option would be Puy lentils. Slow roasting tomatoes in a 250 degree F oven will take an hour and a half to two hours depending on the size of the tomatoes and the moisture content. The tomatoes were cut in half, drizzled with olive oil and balsamic vinegar, and sprinkled with thyme leaves and salt. Just keep checking in on them after about an hour and fifteen minutes until they've reached the semi-dried state you prefer. I roasted the tomatoes a couple of days in advance and stored them in a container in the refrigerator with the oil and vinegar scraped into the container with them. When I was ready to complete the dish, red onion was thinly sliced and left in a bowl with red wine vinegar and salt while everything else was prepped. 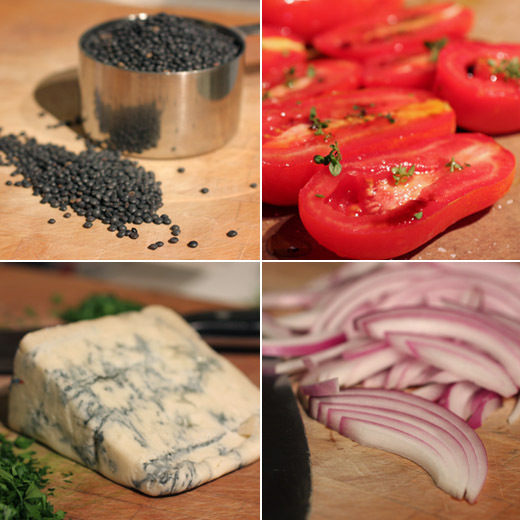 The black beluga lentils were cooked in plain water for about fifteen to twenty minutes until just tender. They were drained and added to the red onion slices. Olive oil, minced garlic, and black pepper were added, and that was left until the lentils were cool. The original recipe calls for chervil, chives, and dill, but I used garlic chives from my garden and flat-leaf parsley. The chopped herbs were added to the cooled lentils and everything was tossed to combine. 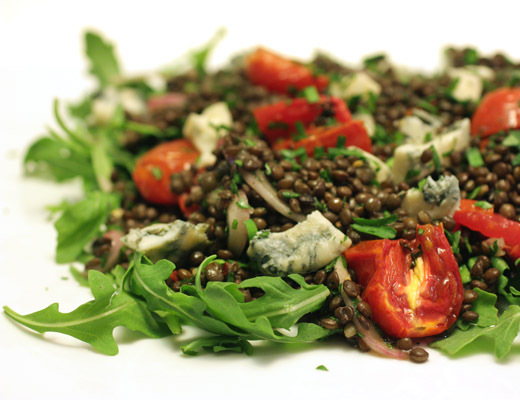 The roasted tomatoes along with chunks of Gorgonzola were added to the lentils as the dish was plated, and I served it on a bed of arugula leaves. With the bite of Gorgonzola and the fabulousness I've already mentioned of oven-roasted tomatoes, this is no shy, vegetarian dish. Simple, earthy lentils carried both well, and the herbs added fresh flavors. My only regret here is that I didn't buy several more pounds of San Marzanos and another freezer for storing them. Declaring something 'the best' is tricky, but I can easily proclaim something like these cinnamon buns to be 'my favorite' I've ever made. 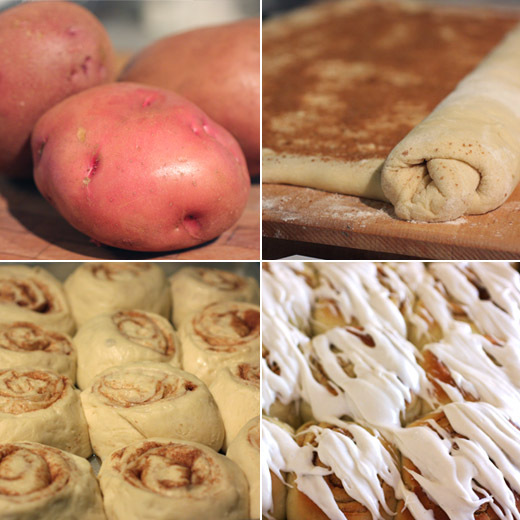 And, I've made lots of different cinnamon buns or rolls. 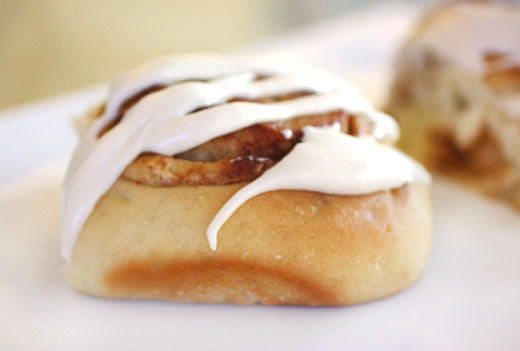 In fact, cinnamon rolls are one reason this blog was started in the first place. I once spent most of a Saturday morning hunting through files and stacks of recipes trying to find the one for some cinnamon rolls I had made before. Several hours later, I remembered the recipe was from an old Better Homes and Gardens cookbook. This blog makes it so much easier to keep track of details like that. But, that was some other version of cinnamon rolls. The ones shown here today are now my favorites. They come from Maida Heatter's Cakes , and the secret is potatoes. I knew potato dough for breads is very tender and fluffy, but I had never considered making cinnamon buns from a potato dough. Maida explains that yeast likes potatoes, and indeed, the dough puffed very well while rising. The twelve buns filled a fifteen and a half inch by ten and a half inch pan. Fear not, there is no flavor of potatoes in the dough. 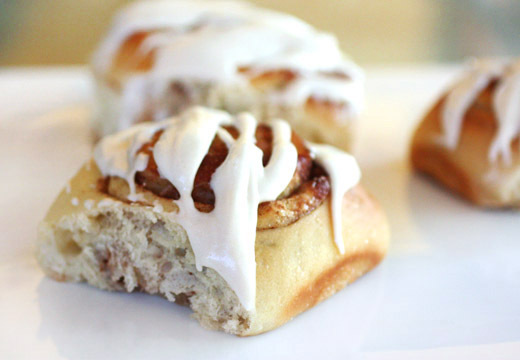 The buns taste buttery, cinnamony, and sweet. The potatoes just affect the texture, and they do so in the best way possible. First, you're going to need some plain, mashed potatoes. Anything leftover that might have been seasoned with salt and pepper or garlic isn't going to work. Maida points out that three quarters of a pound of potatoes will produce the one cup of mashed potatoes needed. The plain mashed potatoes were warmed in a saucepan, and milk was slowly stirred into them followed by sugar, a little salt, and butter. Meanwhile, yeast was added to warm water in a measuring cup, and in a separate bowl, and egg was mixed with vanilla. Then, in the bowl of a mixer, the potato and milk mixture was combined with the water and yeast and egg. Flour was slowly added, and this produced a sticky dough. The dough was turned out onto a floured board, and kneading was easier with a dough scraper. When the dough felt smooth, it was placed in a oiled bowl and left to rise for an hour or a little longer. After rising, it was rolled out on a floured board into an eighteen inch square, covered with melted or very soft butter, and sprinkled with a mix of cinnamon, sugar, and nutmeg. I opted to leave out the raisins. Next, the dough was rolled into a log and cut into buns. I let the covered tray of buns rest in the refrigerator overnight, and then brought them to room temperature while the oven pre-heated the next morning. They baked for twenty minutes, and when cool, the glaze was drizzled on top. I added a few tablespoons of cream cheese to the butter, confectioners' sugar, vanilla and almond extracts, and cream in the glaze. Usually, the best part of a cinnamon bun is the very middle, but these were that good all the way on the outside edge. For years, my favorite cinnamon bun or roll was one made with pumpkin puree, and when October arrives, I reserve the right to change my mind again. Until then, these cinnamon buns will hold the title.